We have galleys! 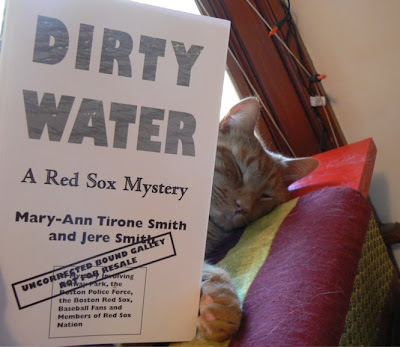 Also known as advance reading copies of our book, Dirty Water: A Red Sox Mystery (by me, Jere Smith, and my mom, "real" writer Mary-Ann Tirone Smith). We'll be sending out copies to some of your more famous types hoping to get some good quotes. My mom has some great connections what with her being a legit author for the last few decades. So we know we'll get some good ones--in fact, we already have gotten some that appear on the galley itself, from Allan Wood (Joy of Sox), Jeff Goldberg (Hartford Courant), and Karen Olson (mystery writer). As well as a couple quotes hyping my blog from Michael Leggett (Random Fandom) and John Quinn (Quinn Media Machine). Thanks to all of those people, and we'll see who else we'll end up with... (Amazing Larry called it a real snoozer...and no that's not the "real" cover in the pic, obviously.) The book will be available in August despite the "official" pub. date of September. Lots more news to come. Last night, the Institute for International Sport (whose publishing arm is Hall of Fame Press, the publisher of our book) held the launch party for the '08 US Scholar-Athlete Games in Providence. I went down and met my mom there (she was honored as "author of the year"), and we got to meet your favorite ex-senator and mine, George Mitchell, who delivered the keynote address. He was really nice, accepted our galley, and told me he'd gone to a couple of Sox games this past weekend. It was weird to be one minute shaking hands with "the senator" while a cameraman filmed away, and then next wiping your mouth with your tenth napkin over at Johnny Rocket's. (They have an awesome veggie burger now).